BETHLEHEM, Palestinian Territories — Pilgrims from across the world gathered in Bethlehem on Monday for Christmas Eve, queueing to see the grotto where Jesus is believed to have been born and taking in a festive parade. Midnight mass was to be held in Bethlehem later, while Pope Francis was also due to hold mass at the Vatican as Christians celebrate the traditional day of Jesus’ birth after a tumultuous year. Much of that tumult has come from Washington, and the festive spirit was dampened there as the national Christmas tree went dark on the third day of a US government shutdown. 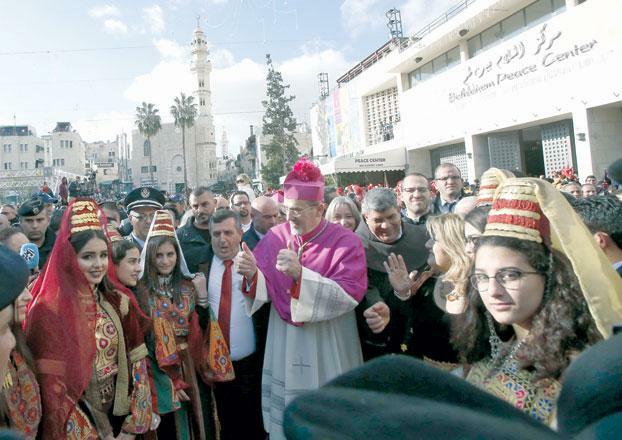 In Bethlehem in the occupied West Bank, the Palestinian scouts and a bagpipe band paraded in Manger Square across from the Church of the Nativity, built where Christians say Mary gave birth to Jesus. The Catholic archbishop for the Holy Land, Pierbattista Pizzaballa, arrived later in the afternoon and was to lead midnight mass. Palestinian President Mahmoud Abbas was to be among dignitaries attending the ceremony. This year, visitors are able to view the Church of the Nativity’s newly restored mosaics after they were recently cleaned and repaired in a major project. Do not the Christians of the West who blindly support Israel realize that there are Palestinian / Arab Christians? (which I thought they should support)?